Receive Multiple Offers. Save Money. Weekly existing home sales volume picked up where it left off two weeks ago, falling slightly from the previous week, while home prices fell to their lowest level in the current five year housing market cycle according to the National Home Sales Snapshot released by DataQuick. There were 144,228 properties sold over the previous thirty day rolling period ending February 23rd, down 0.5 percent from the previous week’s total of 144,914 properties sold and 4.1 percent lower than the 150,375 properties sold four weeks ago. Sales volume is down 24.5 percent from the current year’s cycle peak of 190,934 sales during the 30-day rolling period prior to September 1st. Last week’s home sales volume was 2.4 percent higher than the 140,833 homes sold during the same period a year ago and was 8.3 percent higher than during the same period three years ago when 133,205 homes were sold. 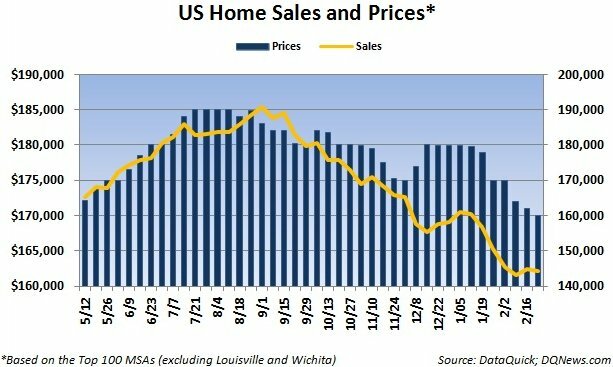 The median price of a home sold over the same thirty day rolling period ending February 23rd fell $1,000 from the previous week to $170,000 and is down 2.9 percent from a month ago. Last week’s median home price beat the current five-year cycle low of $171,000 posted in both the previous week and in June of 2009. Home prices were also 2.9 percent lower than the same period a year ago when the median price of a home was $175,000 and were 8.1 percent lower than the same period three years ago when the median price was $185,000. Over the last five years, median home prices nationwide have ranged from a high of $275,000 to the new low of $170,000 posted last week. Sales volume for a thirty day period within the last five years has ranged from a high of 339,669 properties sold to a low of 124,051. The National Home Sales Snapshot includes 98 out of the top 100 metropolitan statistical areas covering 66.25 percent of U.S. home sales. Congratulations! With the great learning tools we provide for you at MortgageLoanRateUpdate and the offers you have received, you've found the right product and the best rate. Whether you're looking to refinance your current loan, purchasing a new home or looking for a home equity loan, we make it easy at Mortgageloanrateupdate. Our questionnaire is simple and quick to use and your information is safely transmitted to us with SSL encryption. With just two minutes of your time, you could have multiple lenders competing for your business which could save you thousands. MortgageLoanRateUpdate is an independent marketing leads generator. We are not a mortgage broker or lender. MortgageLoanRateUpdate is an advertising supported publisher and mortgage loan rate comparison service that is compensated by third party affiliates for the information you provide to us through the featured placement of sponsored products and services or by clicking on links posted on this website. Not all companies or products are represented through this website. Usage of this site is only available to persons in the continental United States, Alaska and Hawaii.